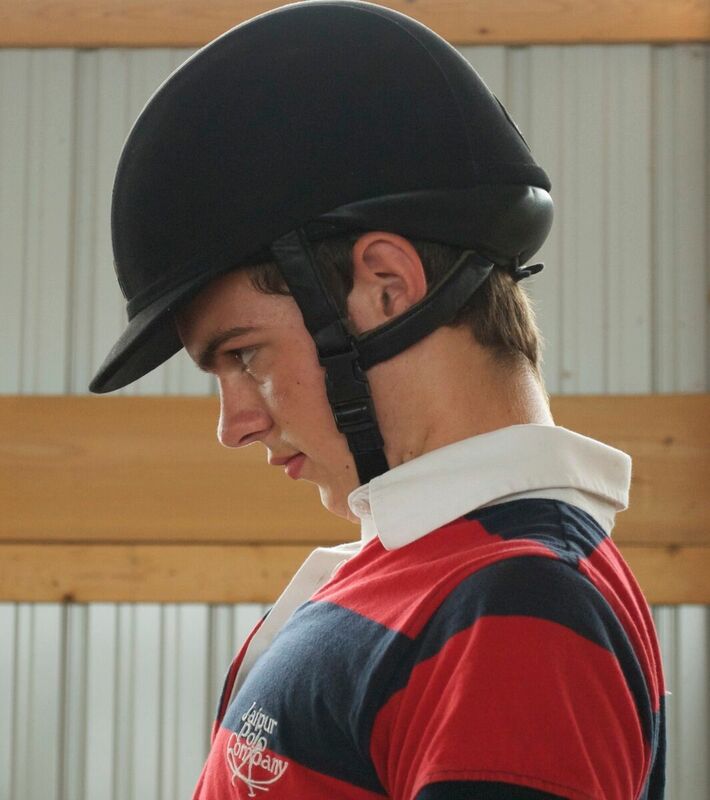 The rider is tucking his chin to his chest and pushing his chest forward. As a result he was always behind the motion of the horse. Do you tuck your chin when you ride? Feel tension in your throat and neck? 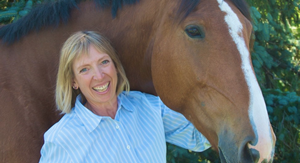 Have difficulty breathing when you ride? Try to pull your chin back to your collar to sit up straight? 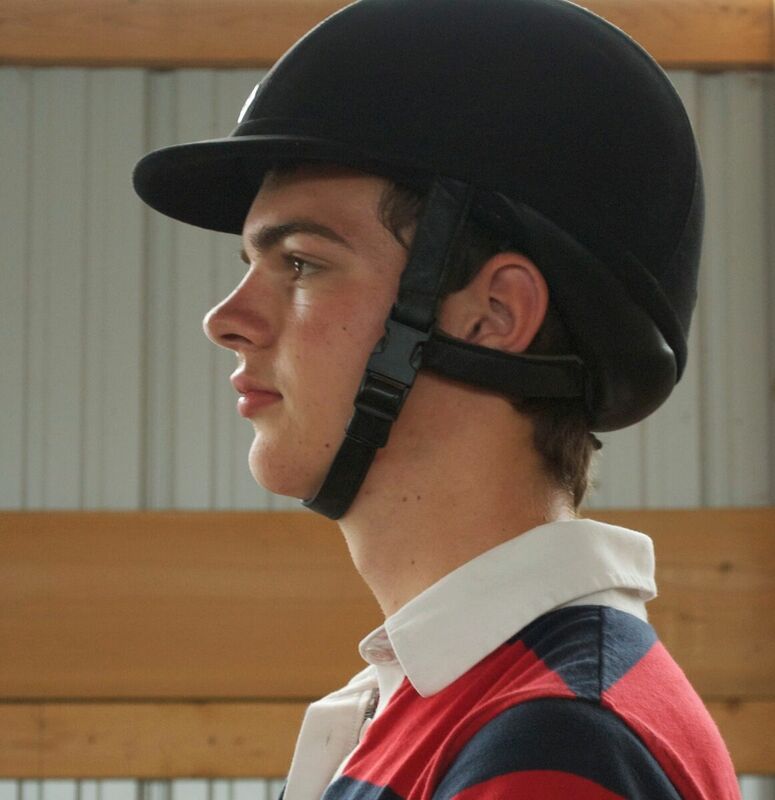 Forcing your head position will adversely affect your rein contact and overall position. Yes, it is important to balance your head for good riding but not by creating tension in your neck. Next time you ride notice what you do with your chin. Do you pull it down and in toward your throat? Pull your head back? Look down at the horse’s withers? Or perhaps you push your chest forward and pull your shoulders back? Do you think of a string on the top of your head and try to pull yourself upward? While this can be a useful image for some, overdoing it can create a too-straight neck and overly tucked chin. Your head weights approximately 8 – 15 lbs. That is about as much as the average bowling ball. It is perched on the top of your spine and supported by the entire spine and pelvis. He has made an “L” with his thumb and index finger and placed the thumb on the sternum and index finger on the chin bone. This lifts his chin and lengthens his neck. Also notice how the chest has softened. Often, when you attempt to “sit up straight” the natural curves are altered. The lumbar curve increases because you have overly hollowed your lower back. The cervical curve increases when your chin juts forward and up and is decreased when you pull your chin toward the back of your shirt collar. 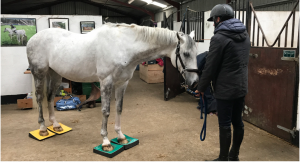 For good head balance it is best to allow the lumbar spine to flatten slightly due to your sitting position on the horse and maintain a natural curve in your neck so that your entire spine can lengthen upward and balance your head with ease. To find a balanced head position take your reins in one hand and make the letter “L” using the thumb and index finger of your other hand. Bring the “L” toward your throat and chin. Place your thumb on your sternum. Most likely it will be at the very top, which is called the “manubrium”. This piece of the sternum is the same of the Superman shield. Place your index finger on the point of your chin. 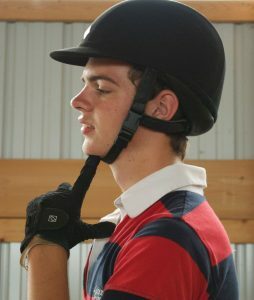 Rest your chin on your finger and feel the length of your neck when in this position. Think of lengthening your neck slightly by “pricking your ears” the way your horse does when he sees something in the distance. Feel how your chest softly rises and your neck lengthens when you keep the “L” and prick your ears. 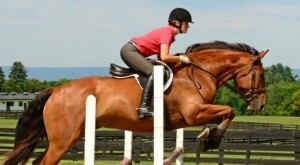 Ride at walk, trot and canter with your “L” marking the position of your chin. Change hands when you change direction. 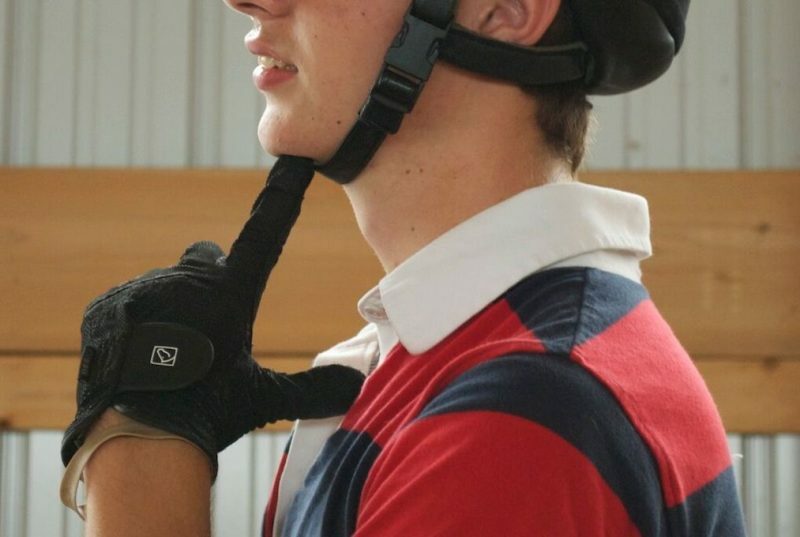 Of course if you need to, return your hand to the reins for steering or if your horse gets anxious. Remove your hand and continue to ride imagining the “L” and pricking your ears. Having taken his hand away he has maintained his neck length softer but open chest so that his head is well balanced without tension while restoring a natural curve to his neck. Use this Murdoch Minute to balance your head. When your neck lengthens without tension by you maintaining a space between your chin and your chest your shoulders relax. This improves your rein contact. When you need to keep both hands on the reins think of pricking your ears to lengthen your neck and always remember to enjoy the ride!